“It has been the worst summer in 20 years”, laughs the Sámi when we climb up into the clouds above Tromsø. We’re 350km north of the Arctic circle. Sharp mountains cliff out of the Nordic Sea, overstraining the neck muscles, when scouting for the craggy summits. It’s mid summer, but rain pours down. 5°C. A light breeze from the west. On the map, a “route” is drawn in dotted lines. It’s supposed to be a trail right? Must be easy. I’ve been studying maps for weeks and on google earth, behind the save gloam of my laptop. Big plans on foot and packraft. 55 days. We could do easily 1000km, right? After a couple of km the trail peters out in a smelly, squishy marsh. The kind of nice soil we would encounter a million times on our rambles the coming weeks. We wear mesh trailrunners with a thin liner. Within a breath, the water soaks around our toes and ankles. Sulking lips. Quickly a cold shivers up our legs. Lightweight footwear. That’s less tired legs and body. That’s why we choose to walk in them. And they have 1 big advantage over classical boots: they dry quickly. Duh. Especially in bloody marches. Ahum. 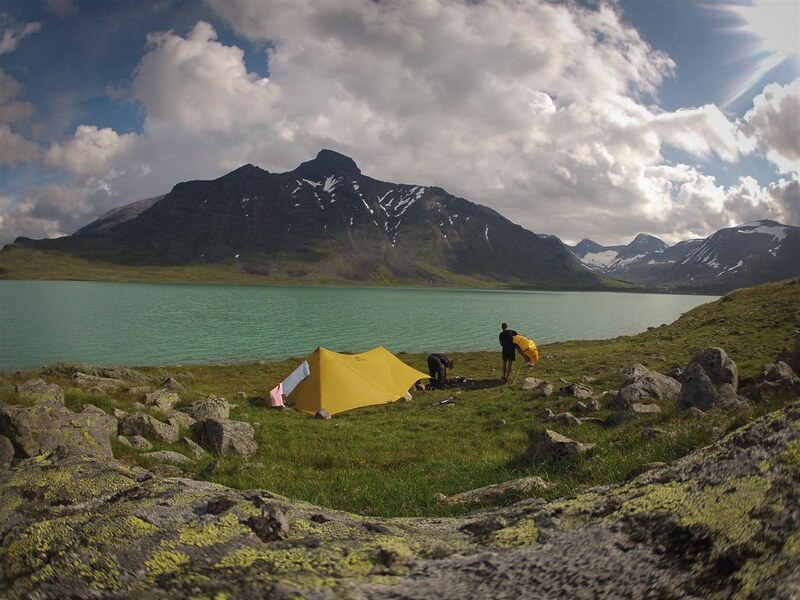 There would be more nice talks about lightweight backpacking and packrafting in the coming weeks. Welcome in the Far North. Fjells. Mountains. Marshes. Lakes & fish mashed-up rivers. Neverending virgin forrest, sheltering abundant wildlife. And mosquitos. Altough they are not as abundant as expected. The worst summer in 2 decades. It has its advantages. Still we were happy with our nest under the tarp, protecting us from the scrumptious blood sucking from above and soaked mother earth from beneath. 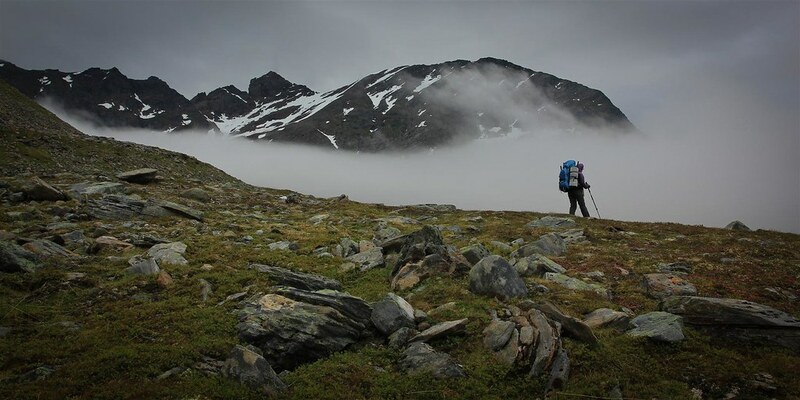 After 5 days walking in our neoprene socks over tyring marshes, bushwalking through thick undergrown birch forrest in low cloud and continuous drizzle, unable to follow the so called “trails” on the map, we were allready behind “schedule” at the foot of the Lyngen Alps. Morality was disgraceful. 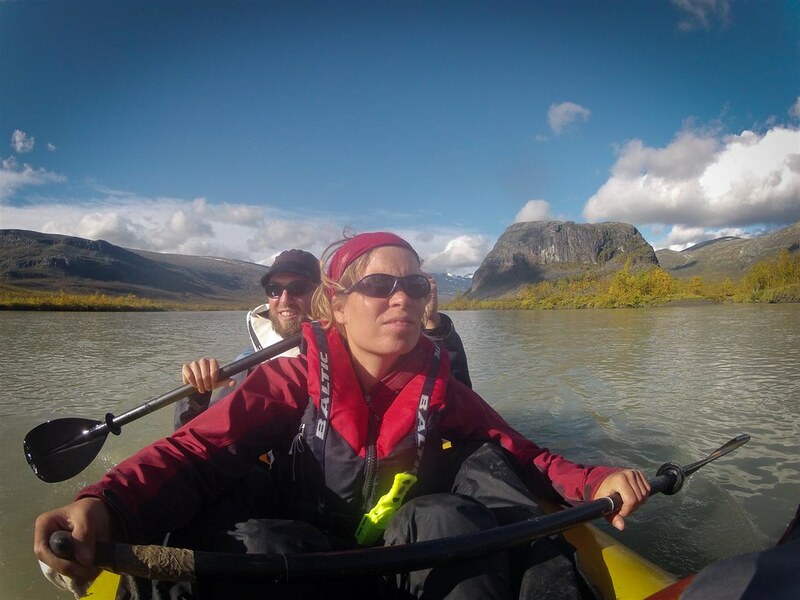 We bailed on our initial route of packrafting and hiking through these craggy, fjorded mountains. The weather was depressing, to say the least. At its southern most point, we left the fresh sea air from the deep fjords in the Lyngen and treaded on south in direction of the Swedish border. 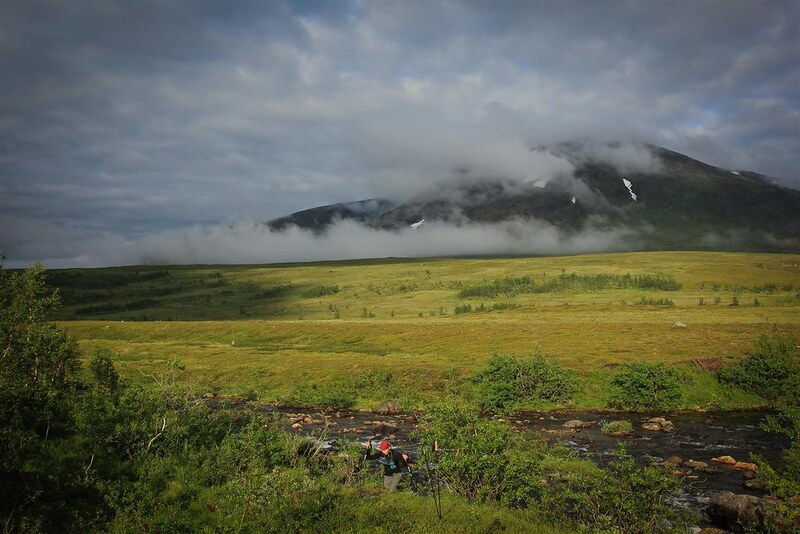 We had a new goal: packrafting our first Laponian river: the Kummaeno. Further from the coast, the mountains get bald and more rounded, the valleys widen up, breaking up into the barren, windswept tundra. 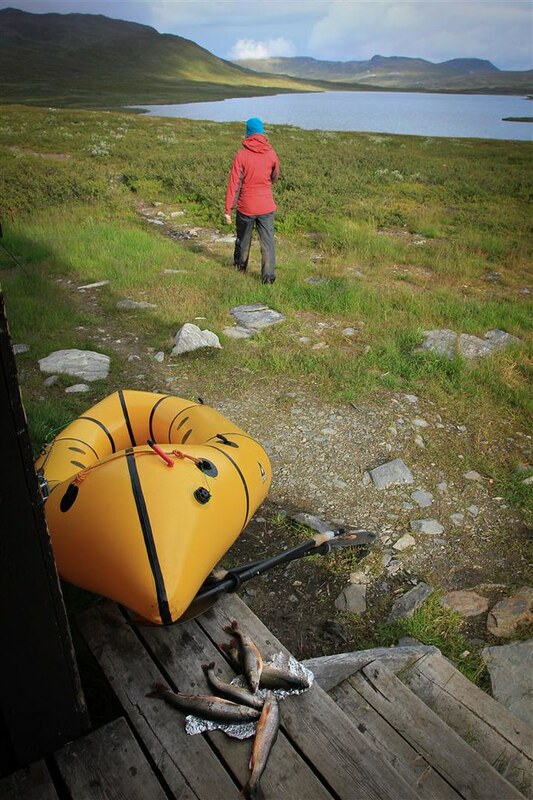 It was the first week of August, we soaked our first real sun rays as we blew up the packraft for our first float above the Arctic Circle. The Kummaeno, probably Sweden’s most northern stream worth naming a river, becomes wide enough after an impressive waterfall, near the STF Pältsa Fjällstuga. The setting is beautiful, we’re eager to float off, but emerging rocks on the surface betray floating problems. A couple of minutes after setting of, we’re allready stuck on the banks. Low water. Anglers seem photographing our struggle, way more interesting then catching the precious Laponian salmon. Halfway the 30-km long river we bail, sick of getting in and out for low water and impossible rock gardens. Two of us plus expedition gear weight in one packraft, will probably only work out on slow flowing, high volume rivers and big open waters. The idea of gettings stuck on a similar river a couple of days hiking south from here, make us decide to reroute our inintial plan and stay closer to the Swedish-Norwegian border, up in the mountains. Emotional rollercoasters reign supreme. The big plan. Tsssss. More changes on the way. Going for fish. Vuoma lake. Øvre Dividal National Park, Norway. 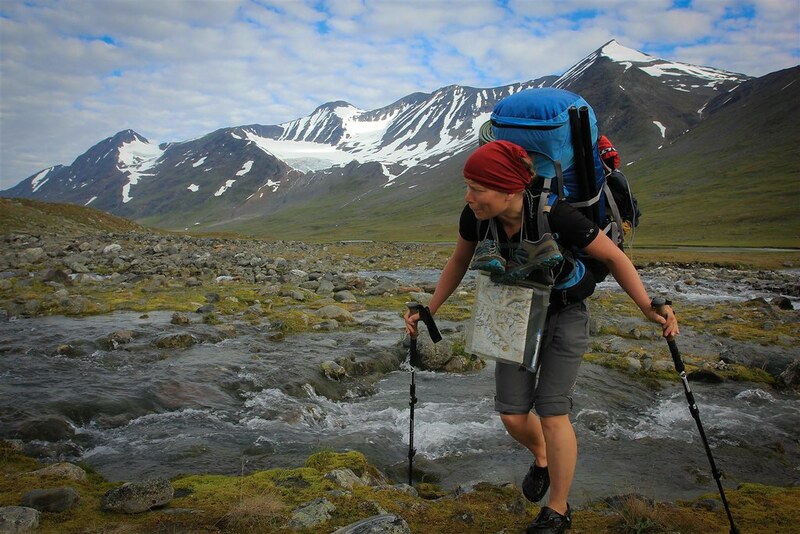 We end up hiking through stunning Øvre Dividal National Park, with its wild roaring rivers, ripping open the granite curst of the mountains into deep canyons, covered with thick birch forrests. Canyons give way for rolling plateaus, where we enjoy our first real clear crips day of the ramble so far. We find an old, used fishing rod in the shed of a DNT mountain cabin near the Vuoma lakes. With some fixed line, a hook and some rain worms, we got from 2 sympathetic Germans, we paddle across to the outlet. We had never fished before, except for the odd-afternoon-out with friends and beers for catching trout in farmers puddles in our Belgian backyard. Arctic char is fighting it’s way up on the second bend after the outlet. She holds the rod, me throwing in the line from the banks. Within an hour we catch 5 nice, neat Laponian fish. We feel like Grizzlies feasting on the runs. That night it was party times. 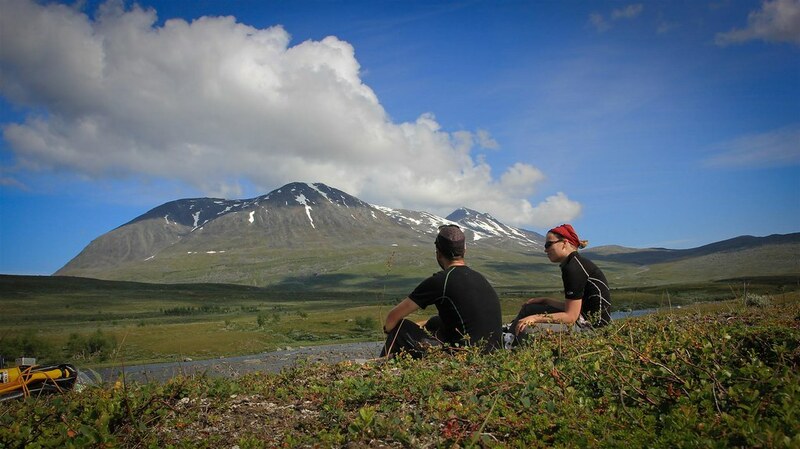 By the time we reached Abisko, the popular starting and ending point for the Kungsleden, August was almost half way. The one and only (!) high pressure of the summer settled above the Laponian mountains. It would hold for 5 days, of which we spent 2 days in the city for logistics purposes. Bummmer. 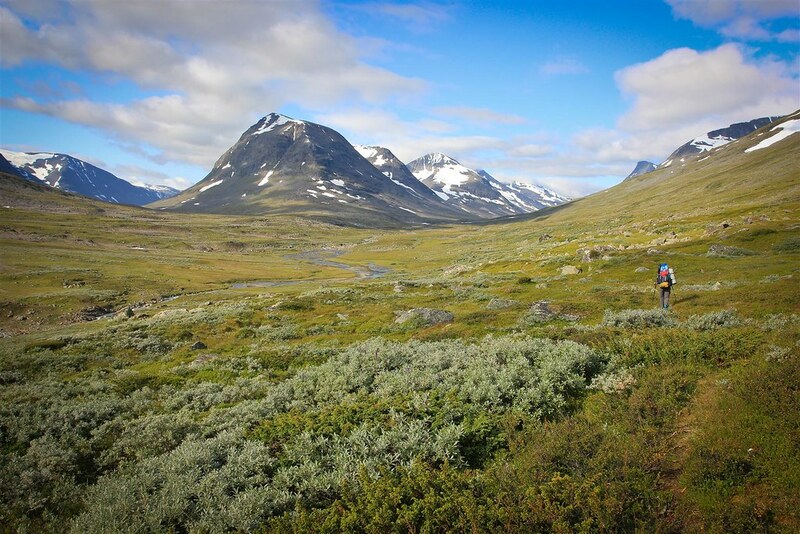 We hurried into the heart of Laponia, at the gates of Sarek NP, where the Áhkká-massif still proudly gards Europe’s last remaining wilderness area. Nice to meet you naked and undone from your winter coat this time. Enjoying the mosquito’s? We rambled into the heart of the ever impressive park. We entered by the same valley we did last winter. Instead of the obvious winter white we were awed by wildflowers adorned meadows, carpeted with concentrated stands of polar whool, betraying the boggy areas. Herds of raindeer would compact on summer end’s remaining snow fields and with the flip of a coin they would move from one impossible sheer cliff into another as they were 1 animal. We bivaouc on scenic lookout spots and enjoy the clouds seducing the mountain crests and summits. 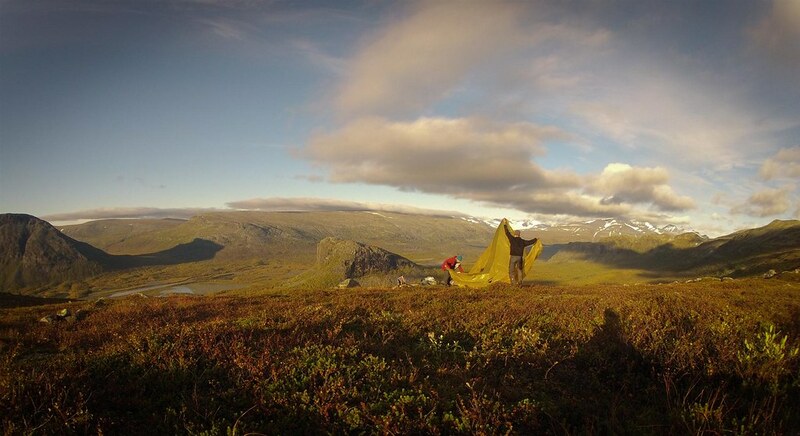 We packraft ever impressive Bierikjarve lake and explore its surroundings. We are struck by nature’s beauty on this alpine splendeur. 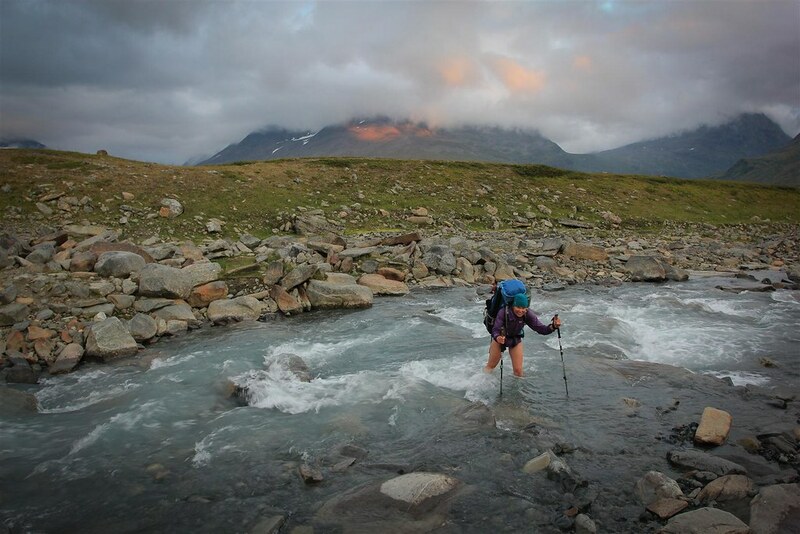 We cross milky glacial tributaries and regret we did not put on the neoprene socks, tucked away deep in the pack. We try our luck on some summits but are chased down multiple times as cloud and rain swallows our joy and view. 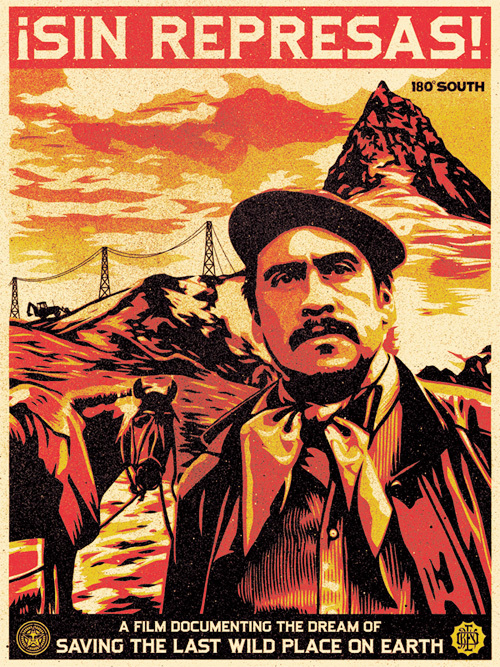 Respect the mountains. Sir, yes sir. We can spend a lifetime here. A lot of mysterious valleys, rivers and peaks to explore. This corner of the world really know how to bite in one’s spirit. Normally this story should continue with our ramble into Padjelenta and up to the Norwegian coast. 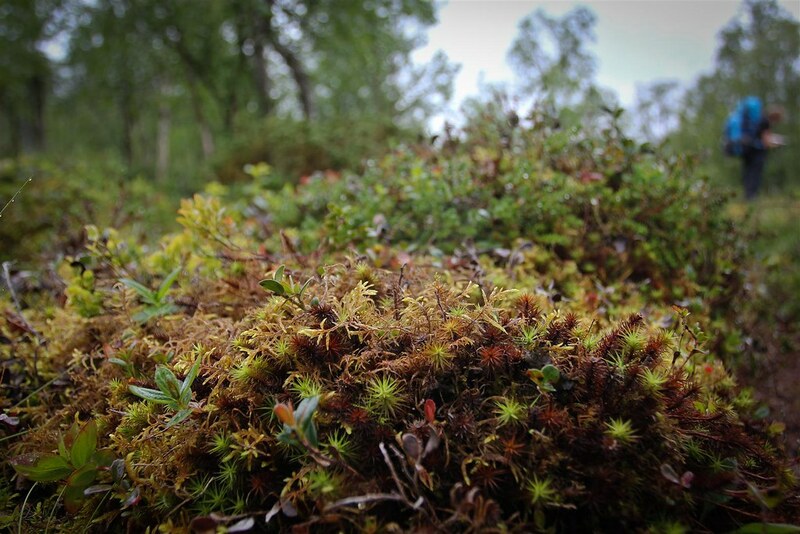 We’re almost halfway our packrafthike through Lappland, but my typing and photo-editing time is up. We’re in Kathmandu, Nepal right now. 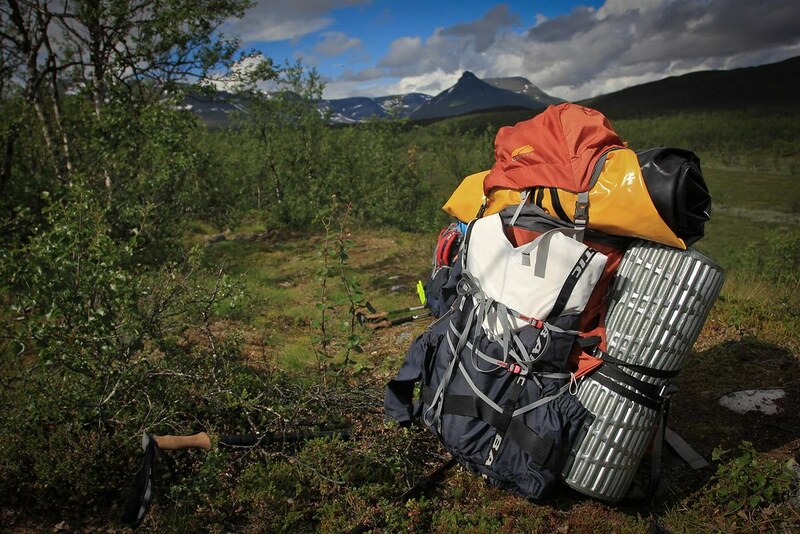 We’re finishing up logisitics for the first leg of a 3-month trek in the Nepal Himalaya. First up is a 45-day trek which we start tomorrow. It will takes us roughly along the Great Himalaya Trail and take us through Humla, Mugu and Jumla and through Dolpo. The provisional photo album is found here. It’s time for another adventure. It’s time to hit the trail. Again. 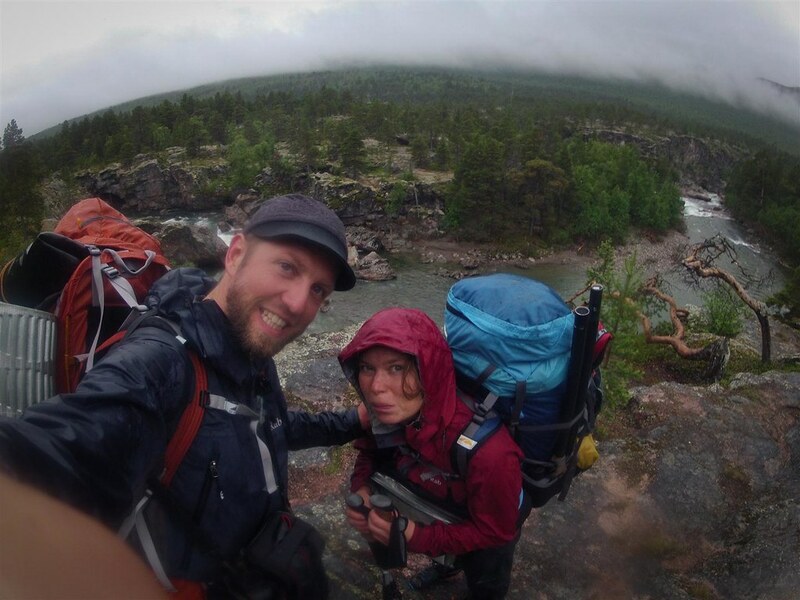 This entry was posted in Backpacking, Gap Year, Packrafting, Trip report and tagged sweden. Bookmark the permalink. 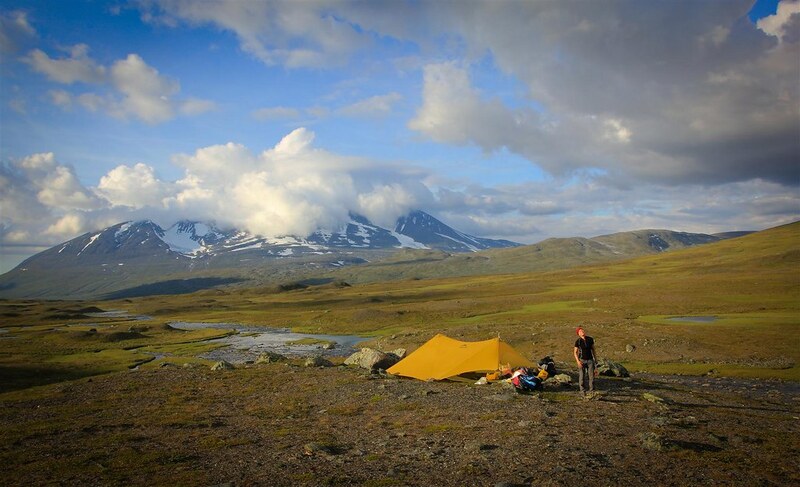 Sarek is magnificent – stoked to see you packrafting there, must have been fantastic. Have a great trip in Nepal! Nice! Great photos of beautiful places, looking forward to the report of the next leg, travel safe! 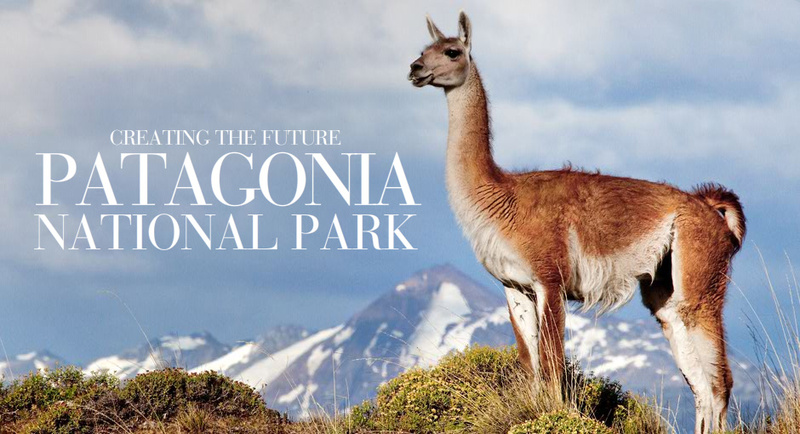 Sir, yes sir – Patagoniandreams kicks it again! Thanks for sharing, and stay safe out there. Great story and amazing pictures of a wonderful trip and performance, Steve and Katrijn!! Congrats! Abraço do Brasil! 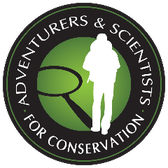 Thank you for sharing your very cool adventures! Have a great time in Nepal! ja mannekes, het weer viel misschien niet mee, maar de foto’s zijn alvast prachtig. Jullie hebben in de eerste weken weer machtige dingen gedaan. have fun in nepal en voorzichtig zijn, hé! Very beautiful! I’m not surprised some of the Lapland rivers were not raftable – a lot of them look bigger on the maps, but turn out to be wide but shallow. And marhes… yes… lots of them. They do get a little annoying. But anyway, it looks like you had a splendid time! Some familiar areas there, and wonderful photography, looking forward to more and more and … Enjoy the next stage. Leuk om jullie avonturen te volgen. 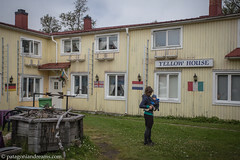 Wij zaten ook een kleine drie maanden in Noord-Noorwegen (een paar trektochten, maar vooral veel gefietst op de eilanden) en zagen jullie namen in de Pältsastugan. De huttenwaard daar herinnerde jullie nog 🙂 Door de slechte zomer was het continu bijsturen (eind augustus zelfs overvallen door een sneeuwstorm niet ver van de Daertahut), maar ‘t was niettemin een zalige tijd. bere! ziet er de max uit! Great trip report ans pics. At least there are enough lakes to paddle up there! 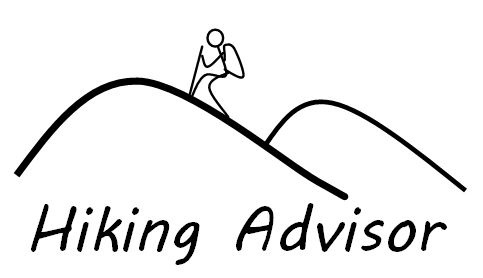 Have a nice hike in Nepal – looking forward. BTW love the raindeer 😉 seems to be the better name. Good stuff Steve! But hey, those were the best weeks of the entire summer! Excellent TR and brilliant photos. Enjoy the next chapter of your adventure and stay safe. 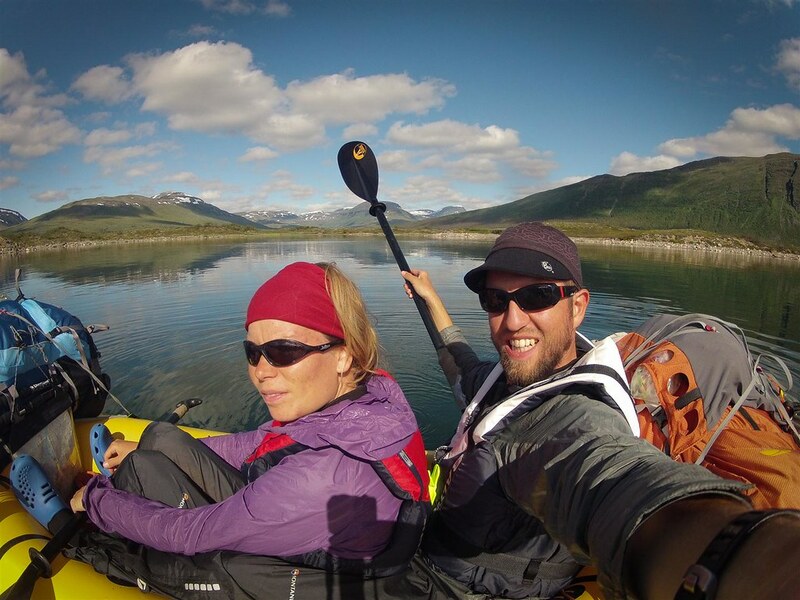 Great trip, although you are not alowed to paddle in Sarek! 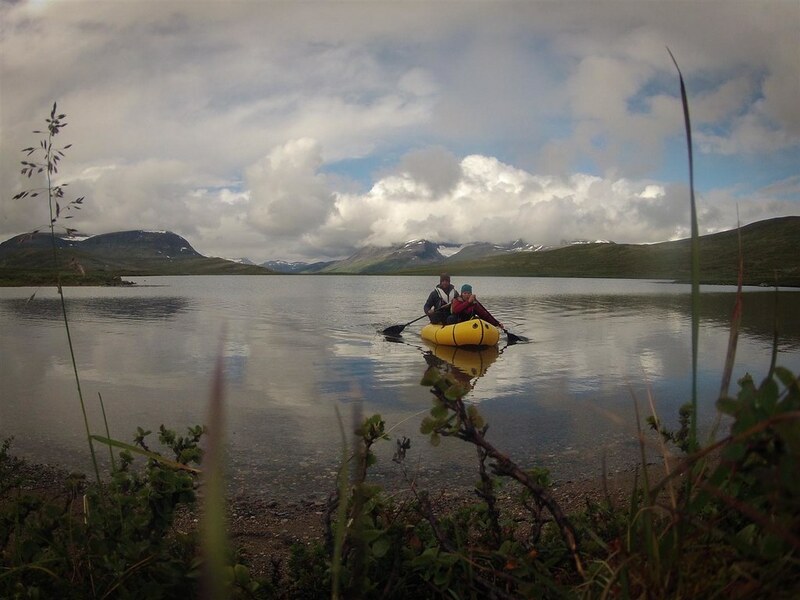 Henrik: Just to set things straight, you are allowed to paddle in most of Sarek. There is only a ban on paddling the Rapa river between the the park border and the junction with the Sarves stream (approx 22 km).